LENZIP offers coil tooth zippers in several gauges with a highly water resistant polyurethane coating. 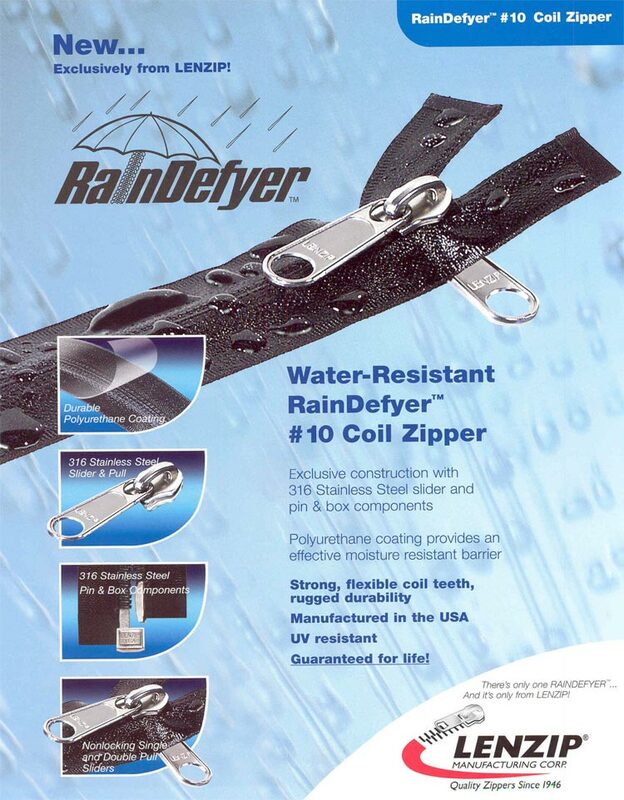 These zippers are NOT 100% waterproof, but will provide a significant moisture barrier. LENZIP offers its exclusive RAINDEFYER #10 water resistant zipper made with 316 Polished Stainless Steel sliders and pin & box components. This zipper offers the ultimate in moisture protection, strength and durability with corrosion proof components. All LENZIP molded tooth zippers are made from DuPont Delrin UV stable resins. Additionally, the tape of the molded tooth zippers are UV protected to resist yellowing and degradation. Many zipper manufacturers will incorporate regrinds into their resin products. Regrinds are scrap plastic material that is reused to reduce costs. This practice adversely affects the molecular structure of the resins and results in a final product that is more susceptible to a weak product and premature failure. LENZIP uses only 100% virgin resins and never regrinds or uses sub-standard resin materials. Coil tooth zippers are made from a polyester resin that is extruded and sewn onto the zipper tape. Coil zippers are strong, flexible and very giving around corners. Coil zippers are the proper material choice when the application requires a zipper to bend or have a slight curve. LENZIP offers coil tooth zippers in 6 different gauges including #2, #4.5, #5, #7, #8 and #10. Many gauges are available in multiple tape widths.